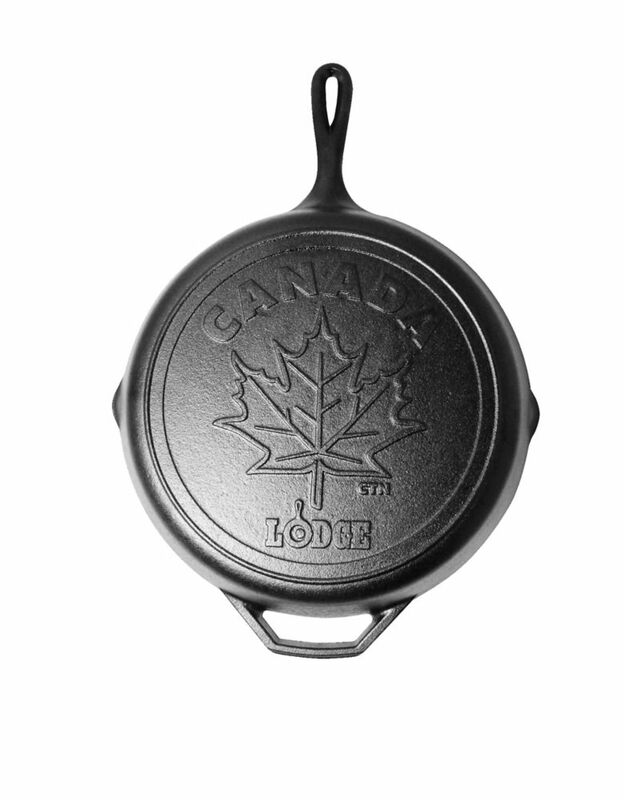 Lodge is proud to have designed a limited edition, designed in Canada, produced in the USA cast-iron skillet. This 12 inch skillet represents Canadian Imagery with the Iconic Maple Leaf Scene. Synonymous to Canada, Commemorating Lodge's long history providing USA made exceptional cast-iron cookware for the Canadian Consumer. Allowing for exceptional even heating quality with advanced metallurgy to create a safe and easy to use skillet to cook a vast range of recipes. We hope that you will enjoy cooking in these well made skillets as much as we were in designing and creating them! The right tool for searing, sautéing, simmering, braising, baking roasting, frying. Unparalleled in heat retention and even heating. At home in the oven, on the stove, on the grill or over the campfire. Our continued commitment to quality and innovation is marked by the introduction of our Classic Collection Stainless cookware, designed to meet the demands of gourmet chefs, this professional cookware features the Cuisinart signature stainless steel exterior, polished to a brilliant mirror finish. Set Includes: 1-1/2 Qt. (1.4 L) Saucepan with cover 3 Qt. (2.8 L) Saucepan with cover 3-1/2 Qt. (3.3 L) Sauti pan with helper handle and cover 8 (20 cm) Open skillet 10 (25 cm) Open skillet 8 Qt. (7.6 L) Stockpot with cover. Now you can prepare Greek yogurt dishes quickly and easily with Euro Cuisine! This unique strainer kit transforms up to 2qts of ordinary Euro Cuisine homemade yogurt or store bought yogurt into thick, creamy Greek yogurt in a matter of hours all inside your refrigerator. Enjoy healthy dips and spreads, delicious Tzatziki, low-calorie salad topping, or delicious sweet berry desserts! Recipe book included. Great for use at the campsite or in the kitchen! King Kooker 12 inch Cast Iron Skillet. Skillet has helper handle, primary handle and pouring spout sides. Includes hole in primary handle for hanging. Cast iron construction allows for even heat distribution, eliminating cold spots. Excellent for frying! Pre-seasoned and ready to cook! Sleek and Smart Want to cook big, beautiful, ambitious meals in a sleek, smart oven? This expansive range opens up the possibilities in your kitchen and looks fantastic at the same time. It has 6.4 cu. ft. capacity along with powerful burners, convection cooking and innovative features--everything you need to prepare meals like your favourite chef. Lodge Canadiana Series 12 inch Cast Iron Skillet with Maple Leaf Scene - Limited Edition Lodge is proud to have designed a limited edition, designed in Canada, produced in the USA cast-iron skillet. This 12 inch skillet represents Canadian Imagery with the Iconic Maple Leaf Scene. Synonymous to Canada, Commemorating Lodge's long history providing USA made exceptional cast-iron cookware for the Canadian Consumer. Allowing for exceptional even heating quality with advanced metallurgy to create a safe and easy to use skillet to cook a vast range of recipes. We hope that you will enjoy cooking in these well made skillets as much as we were in designing and creating them! Lodge Canadiana Series 12 inch Cast Iron Skillet with Maple Leaf Scene - Limited Edition is rated 4.8 out of 5 by 4. Rated 5 out of 5 by Darren Mittle from Wow, I love my new cast iron pan!!! Fabulous cooking, and nice design on back. It is pretty big though, so will need the 10’ too. Rated 4 out of 5 by Marilyn from Great deal Love it ,no need to cram the food together . We have a couple 10” cast iron pans from yrs ago and needed and wanted something bigger and this fit the bill perfectly in both size and cost.